This past Sunday after church we stopped by the farmer's market while we were in town. 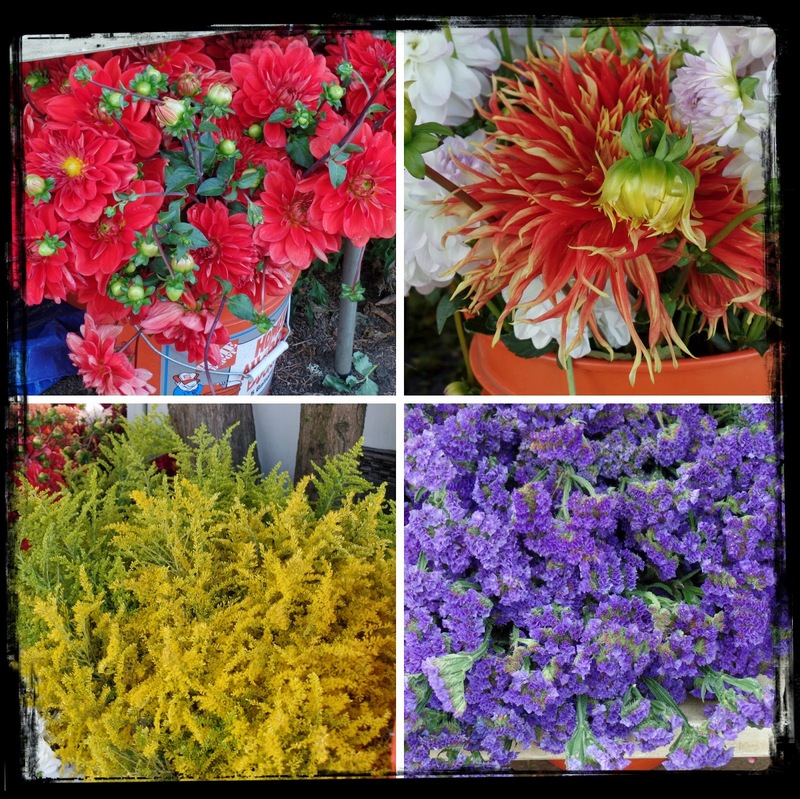 The Farmer's Market we go to in Milwaukie, Oregon always smells so delicious, between the cooking sausages and kettle popcorn, and all of the other delicious food stands, the air is filled with yumminess! 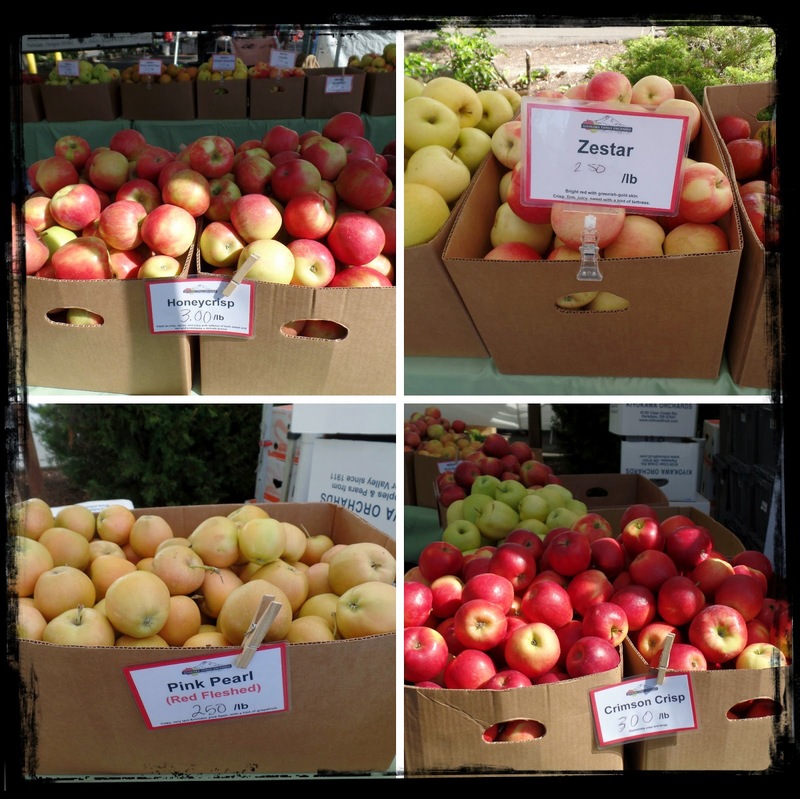 We were there to pick up a bag of fresh kettle corn and try out some new varieties of apples. 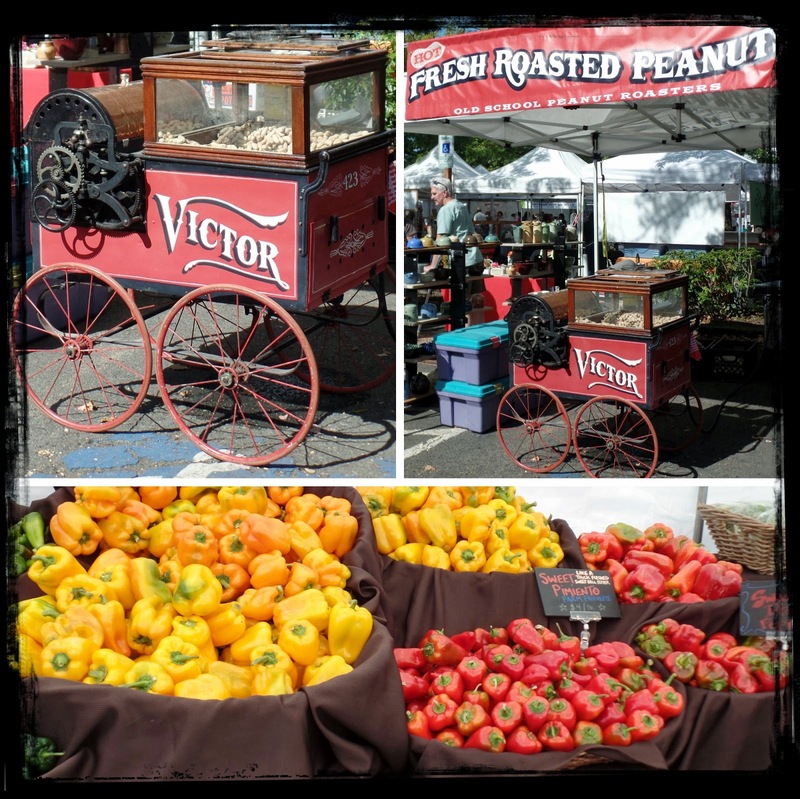 I love all of the colorful sights at the farmer's market, even though I don't eat nuts, I thought this old fashioned fresh roasted peanut stand looked fun and nostalgic, and the produce colors were so vibrant! 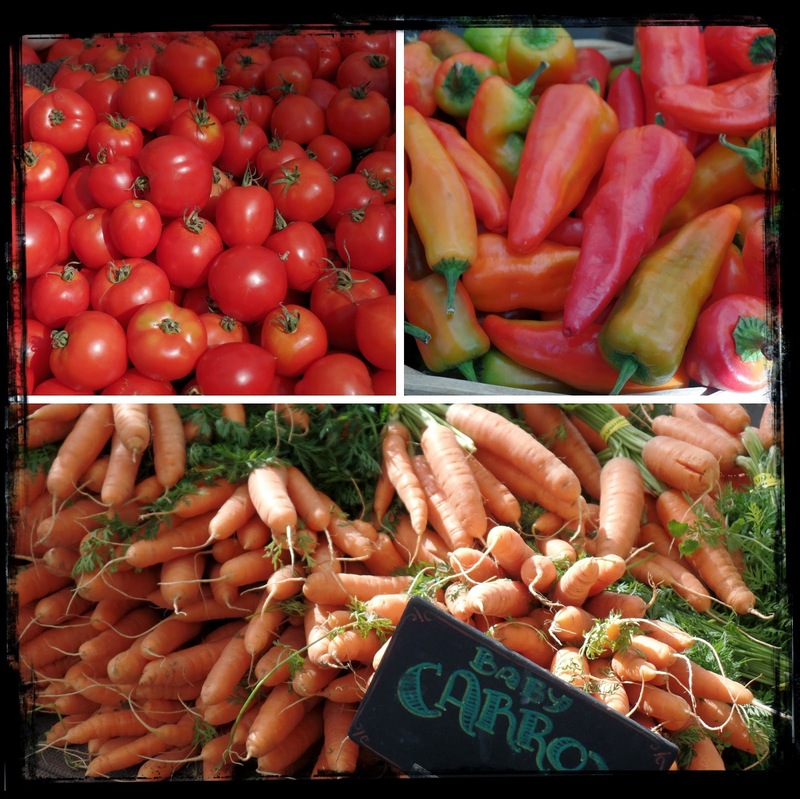 So many beautiful fresh veggies! The flowers were also amazing, I just love rich fall colors! I was excited to see how many different varieties of apples there were when I got to this apple stand. Lots that I hadn't tried before, so I made sure to get a few of each, and of course a nice big bag of my favorite Honeycrisp that I look forward to every fall! I'm excited to try the red fleshed variety called Pink Pearl. 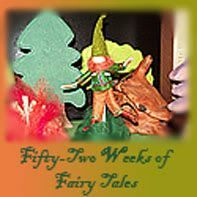 After picking up a nice selection of apples for all of my fall apple recipes, we spent some time having some family fun. 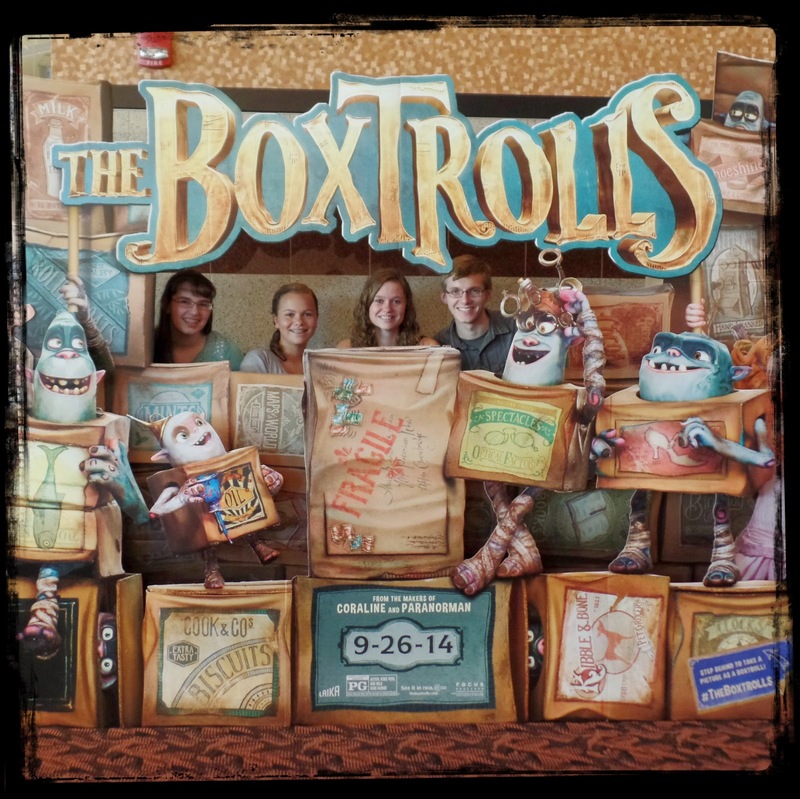 I was very eager to see the new movie The Boxtrolls, I love stop-motion filming, and I also thought it was pretty neat that this film was made right here in Oregon! The movie was wonderful, and definitely lived up to my expectations. The theater was packed and everyone, young and old, seemed to really enjoy the movie. Very visually interesting, funny, and creative. I loved it and look forward to watching again when it comes out on DVD. 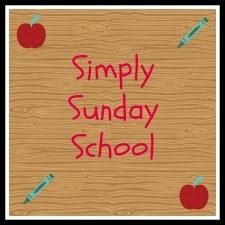 Definitely an enjoyable family Sunday! 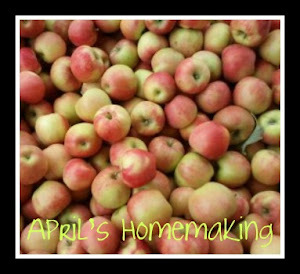 This week the house is smelling delicious with the aroma of cooking apples, I made a big batch of Apple Butter and last night for dessert I made a recipe that was passed down to me from my Grandma- Dutch Apple Cake with Dessert Sauce. This is a simple and delicious cake and perfect for a fall dessert. Beat- 2 eggs and 1/2 cup of milk, then mix in the melted butter. Mix the wet ingredients into the dry ingredients until mixed thoroughly, I just did this by hand. Put mixture into a greased baking pan, the recipe called for an oblong pan with no dimensions given, I opted to use my smaller rectangle 11 by 7 inch baking pan, my 9x13 pan seemed too large, I also think a deep 9 inch pie pan would also work nicely. Peel, core, and slice 2-3 apples about 1/4 inch slices. Overlap the apple slices in rows on the top of the batter, sprinkle the top with a cinnamon and sugar mixture (I forgot to add the cinnamon sugar to the top until it was part way through cooking so not all of my cinnamon sugar was melted on as you can see in the picture, and I think I actually liked it like that, so you can either add the cinnamon sugar at the beginning of baking or about 20 minutes in.). 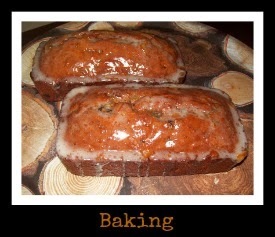 Bake at 400 F. for 30-45 minutes until cake tests done and is nicely browned. 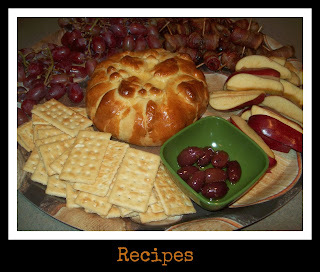 Cool slightly and serve with warm dessert sauce. In a sauce pan bring 2 cups of water and 1 cup of sugar to a boil while stirring. Make a slurry of 2 rounded tablespoons of cornstarch and a little water, add to boiling sugar water and stir until thickened (the consistency of a brown gravy), if the sauce becomes too thick add a little more water (a small amount at a time), if it is not thick enough add a little more of a cornstarch slurry perhaps another half a teaspoon or so. 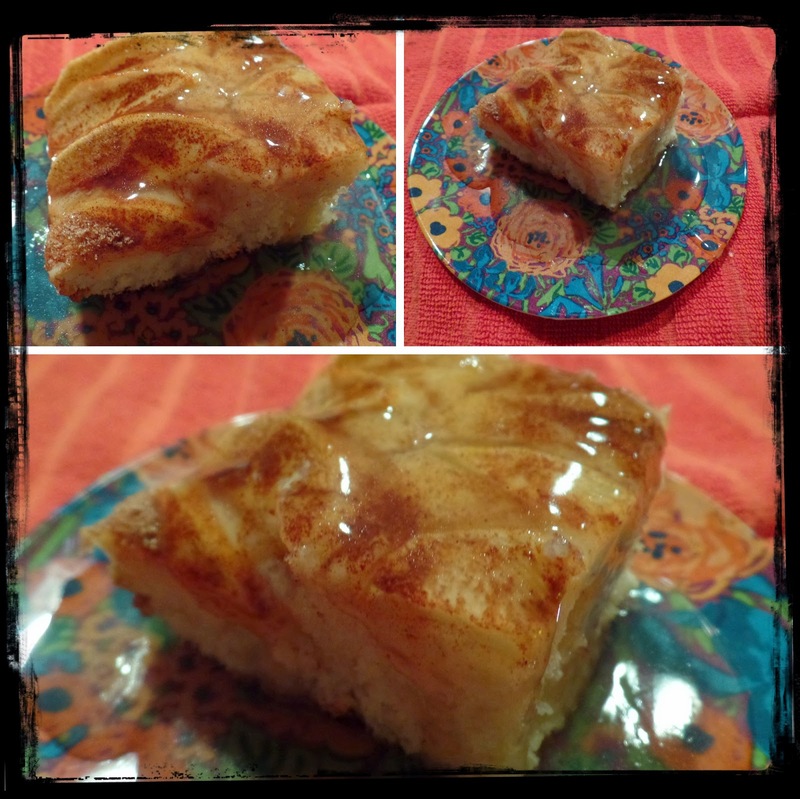 When sauce is to desired thickness, remove from heat and add 1 teaspoon of butter, 1 teaspoon of vanilla extract, and a pinch or two of cinnamon, stir and serve over warm apple cake. 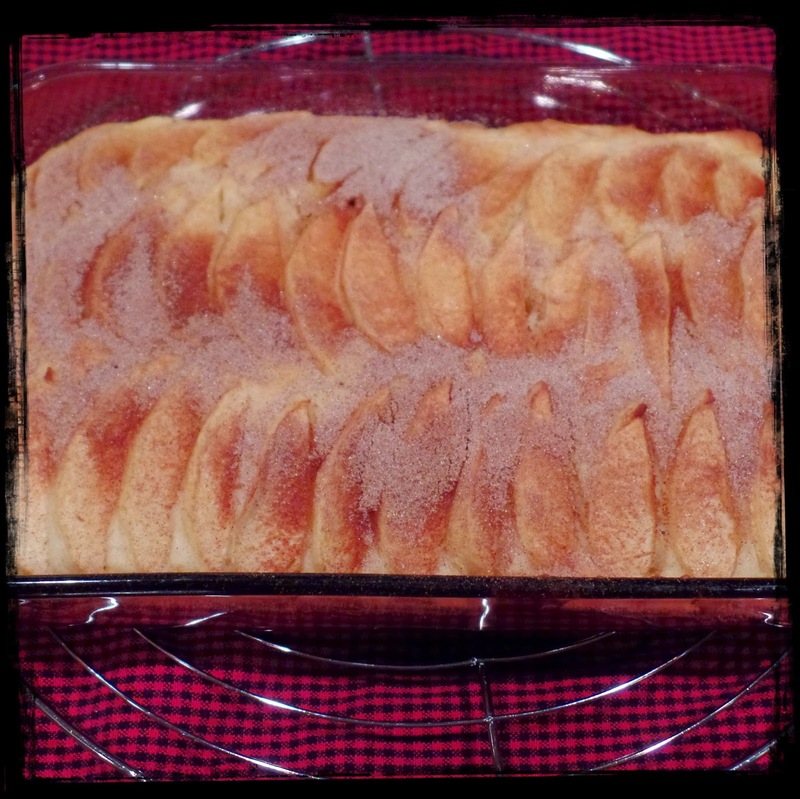 This dessert sauce was a favorite of mine growing up, my grandma would serve it over this apple cake, her Cherry Carnival dessert, and peach cobbler, it really makes a nice dessert topping. Everyone enjoyed this fall dessert. 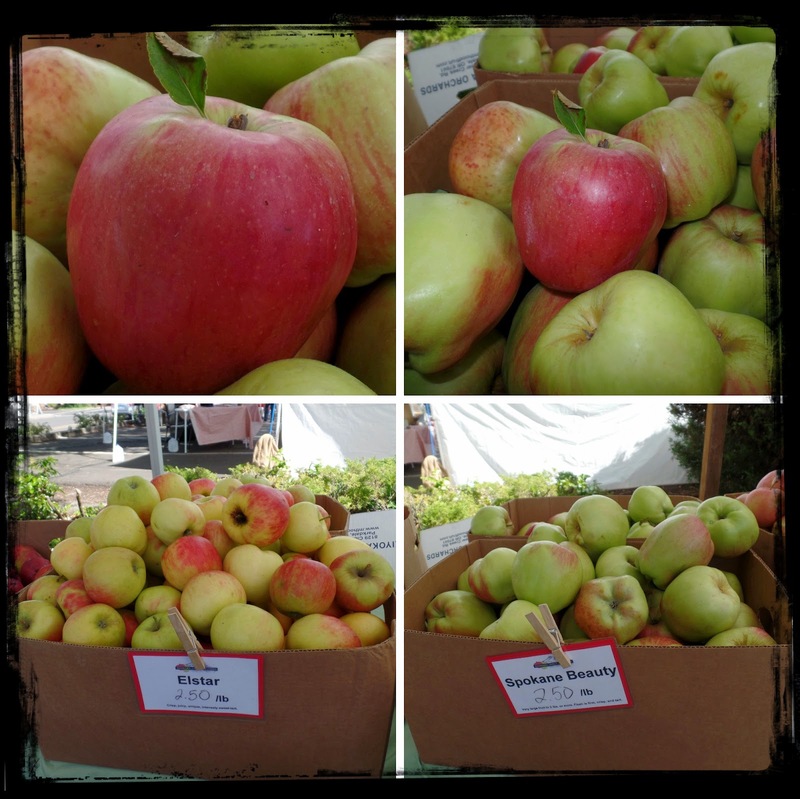 I am looking forward to cooking up the rest of my farmer's market apples throughout the week!